No wonder visitors could bump into the merchandising of the biggest soft drink producer or world-renowned electronics concerns in the production room in Oldenzaal. Our entire operation runs on a small team of 8 full-time employees, but our organization is very flexible, which is why we can handle big projects. Our average order size is not that big, but if Anderlecht becomes the Belgian football champion and they need 15.000 scarfs stat, we’re the ones who pull it off. A 15.000 fan scarf order is no laughing matter. A fast and smart purchase of the proper material is essential, not to mention the Phoenext expertise in the production path from print, confection to textile creation. For textile prints, Phoenext relies solely on transfer sublimation print. An inverted left-to-right image is printed on sublimation paper. This paper is then transferred to paper in a calender by means of heat and pressure. 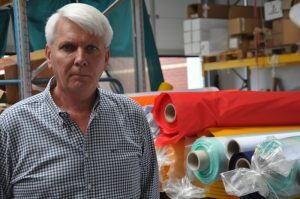 This technique delivers the best quality at the highest resolution for textile printing. 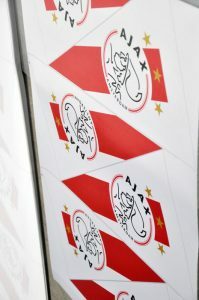 Michel Prins at Mimaki textilel specialist Texo Trade Services (TTS) in Waddinxveen illustrates the difference by means of two printed pillows. “The pillow that is direct printed textile, shows a blurry cross-over between the copy and the logo. The transfer sublimation printed pillow on the other hand shows a pixel-perfect print with the sharpest of details.” Transfer sublimation is the TTS specialty. That’s why Jakob Lameijer continues to work with them after all those years. “Transfer sublimation also became our expertise over the years. And TTS provides us with all the support we need”, Lameijer confirms. But TTS went way beyond merely installing a new printer. According to Prins the Mimaki TS34 was not functioning to its optimal capacity. “The machine ran too slowly and consumed too much. The printer was actually running at too high a resolution.” Lameijer also noticed that the ink consummation was too high. 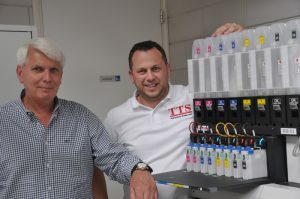 “Daily refills for black prints became a daily necessity – that’s just crazy.” So aside from installing the new printer, TTS also optimized their current set-up and transferred from the Mimaki SB52- to the Mimaki SB53-inks. These Mimaki SB53 transfer sublimation inks have a high viscosity and only produce a minimal amount of volatile organic compounds. Not to mention the 20% cost reduction they offer. The Mimaki SB53-inks also carry the OEKO-TEX® approbation mark, this guarantees that the applied chemicals in the sublimation inks are not hazardous to the environment, making the ink perfectly suited for durable textile applications. Both transfer sublimation printers at Phoenext are operating as they should, handling both smaller productions and larger orders. This is partly due to the Mimaki Bulk Ink System (MBIS) that both printers run on. It makes sure the printer does not have to refill inks as often, which enables longer, uninterrupted production runs. Some even without a supervising operator. “We consider this kind of bulk system a necessity at companies that handle so much production as Phoenext does.” Prins states. The Mimaki JV150-series is considered an affordable model, ideally suited as an entry model for both small and large textile applications. The Mimaki JV150 is a multipurpose printer that comes in two setups: direct print (sign and graphics) or a transfer sublimation printer (via sublimation paper on textile). This article is written by Arthur Lubbers for PRStory as requested by Mimaki.